The First Judicial District Commission on Judicial Performance unanimously recommends that Judge Ann Gail Meinster BE RETAINED. Judge Meinster was appointed to the First Judicial District Court in October, 2011. This is Judge Meinster’s first performance review. 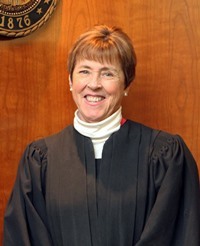 Prior to her appointment, Judge Meinster was a First Judicial District Court Magistrate for two years with a primary focus on juvenile and domestic relations cases. Judge Meinster has additional juvenile and domestic law experience in both public and private practice extending back almost thirty years. Judge Meinster earned her law degree from the University of San Diego School of Law. The Commission conducted a personal interview with Judge Meinster, reviewed opinions she authored, observed her in court and reviewed surveys sent to attorneys and non-attorneys. Survey results from attorneys rank Judge Meinster above average in areas of demeanor, fairness, and caring. From attorneys responding to the survey, 80% recommended to retain, 10% not to retain, and 10% made no recommendation regarding retention. Of non-attorneys responding to the survey, 93% recommended to retain and 7% not to retain. In addition to a docket that is 90% juvenile and 10% domestic cases, Judge Meinster has other related responsibilities and commitments both in and out of court related to the juvenile law. She presides over a specialty court (FIT) that deals with family drug dependency issues. She chairs the multi-agency Jefferson County Juvenile Services Planning Committee, which coordinates several administrative efforts. Moreover, she is active on a number of juvenile justice related local and statewide committees. For this upcoming term Judge Meinster has committed to improve her docket management, a weakness identified in the survey. Based on the above findings, the Commission unanimously recommends that Judge Meinster BE RETAINED.